Marcus and I made a visit to Wylie Dufresne's Lower East Side restaurant last month (though, I would more like to call it a "kitchen laboratory" than anything else, as I could totally imagine his team in the kitchen, toques and all, equipped with the standard latex gloves, beakers, and safety goggles). 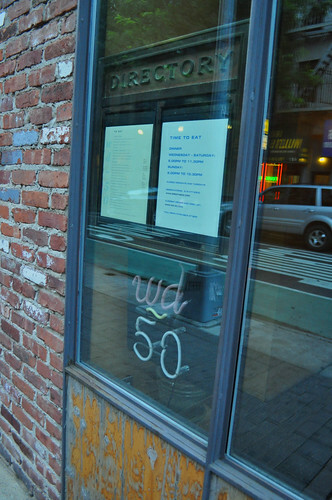 wd~50's window signage. So unusual for a one-Michelin star restaurant to be boasting a neon-powered sign reminiscent of dive bar's ale and lager taps or even a Chinese take-out joint. At the same time, however, it is inexplicably perfect. I just can't quite put my finger on it. 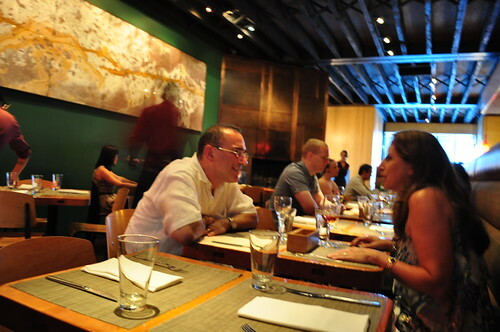 The interior of wd~50 showcases very contemporary art, which fits the atmosphere and the importance of innovation (i.e., application of molecular gastronomy) behind Mr. Dufresne's culinary vision for wd~50. 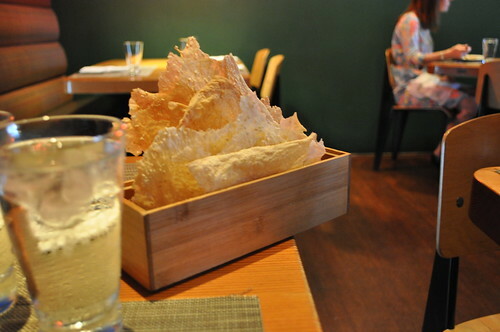 Unusual bread basket with sesame sprinkled cracker-like bread as thin as tissue paper. Very light in taste and took up no real estate in our stomachs (my best friend, Lisa, likes to talk about her stomach as if it were "prime" real estate that she owns, and thus, needs to carefully contemplate whether said intake is worth "occupying" such "valuable" stomach-area). Maybe it was completely intentional so that we wouldn't fill up on carbohydrates, but instead, to concentrate on the unexpected yet somehow feasible interplay and conversation of tastes that Mr. Dufresne has staged for our palates, about which to marvel and speculate. Which is exactly what he did. 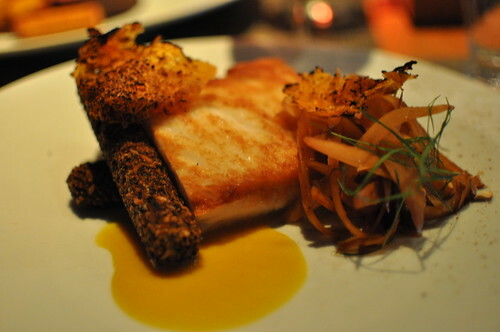 My main course was the skate with sweet and sour salsify, wild rice, and butternut squash. The skate was cooked very well, topped with orange rinds (not sure how they prepared it, though). The log-like items to the left are composed of wild rice (I assume they breaded the outside somehow) and to the right is the sweet and sour salsify. 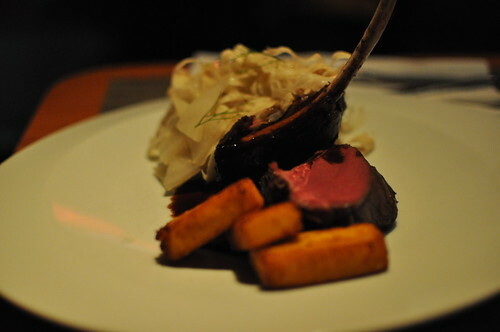 Overall, the dish was satisfying, but it wasn't necessarily something I'd go back to wd~50 for. Marcus: This damn thing is so difficult to cut through! This confused me because it looked on the rarer side (just the way I like my steak/venison prepared). Stefie: Is it overcooked? I mean, if it is, you should ask them to remake it for you. Stefie: Uhhh, I don't know what to tell you then. Marcus: OMG, why is this so hard to cut?! Stefie: Ahhh, stop hacking at it! Here, let me try. I used my own knife to attempt cutting a piece, and for me, it ended up surprisingly easy to cut. Marcus: What! How did you do that?! Stefie:What are you talking about? It's so easy to cut! Wow, it's delicious! It melts in your mouth! Marcus: I knowww! That's why I want to eat it, but I can't freaking cut it! Stefie: Hmmm, maybe it's your knife--it might be too blunt or something. Marcus: I don't know, maybe. The venison is still good, though. There wasn't much left to cut so we couldn't really test whether it was his knife or his (poor) cutting skills. Haha, guess we'll have to test that another time! 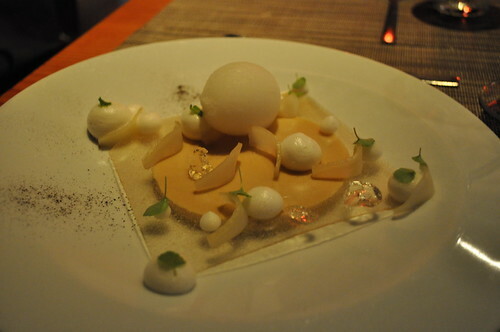 For dessert, we decided on the licorice custard with sake sorbet and Bartlett pear. I'm not particularly into licorice (in my opinion, it tastes like cough syrup--ick! ), but Marcus is a big fan. When I saw it as one of the listed desserts, I had a feeling that's the dessert he really wanted us to order. There were other pretty outrageous offerings for dessert (including a lemongrass mousse with brown sugar, jack fruit, and whole wheat sorbet), but the licorice one seemed the most unlikely of pairings. I gave in. The dessert itself was very delicate as it all rested on thin tile of hardened sugar, which then rested on top of the disk of licorice custard. The large white ball in the top was the sake sorbet. It was certainly the most bizarre combination of flavors I've ever tasted in a dessert--the custard had a very subtle licorice flavor, the sake sorbet was VERY sharp and biting on the tongue (as it is composed of alcohol), and the crushed sugar tile gave the bites we took a little crunch. Somehow, it all reconciled to be a very refreshing way to end our meal. Findings: I'm not sure how Mr. Dufresne manages to pull together such innovative menus every season, but he certainly has many tricks up that sleeve of his! While our main courses were delicious and savory, Mr. Dufresne gets the nod from us for his licorice custard dessert! This and the other wild compounds of unlikely flavors and tastes on the menu definitely require a visit from any foodie who wants to be blown away and impressed by sheer culinary brilliance. I would love to come back here at a later date for drinks and share a few appetizers with friends, so we didn't have a chance to order any this time around. Price point: $29-34 for each main course; $15 for dessert.